We created these fonts for our Bitblox alphabet blocks. They were inspired by the low-res pixel lettering seen on the computer screens and in video games of yore. The fonts are guaranteed to induce flashbacks in anyone who’s been exposed to consoles / terminals / IBM / DOS / AS/400 graphics in the olden days. Each Bitblox character is built on a grid of pixels known as a matrix. The matrix creates constraint, but that very constraint yields interesting and evocative forms. 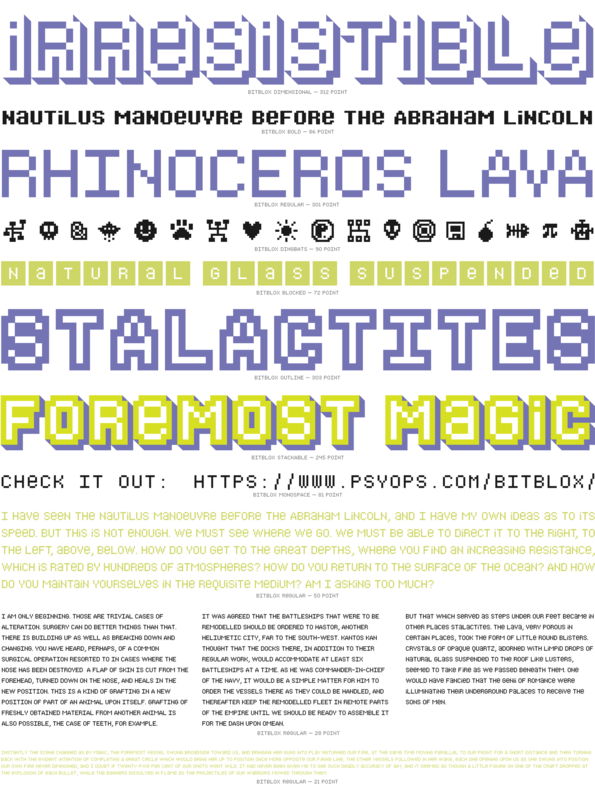 The Bitblox fonts contain Western and Eastern European characters, Mathematical symbols, Dingbats and more. *Bitblox Monospace is available for free with a personal license. Other options are available.